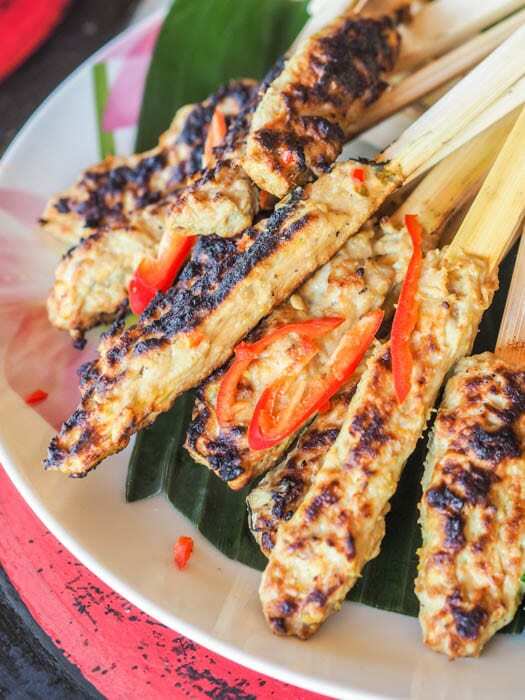 Grilled fish skewers are a traditional Balinese recipe made with tuna mashed with spices and Balinese paste, then formed into patties and grilled. The perfect summer recipe that is packed full of flavor. Grilled fish skewers make for the perfect summer time recipe. I made these grilled fish skewers for the first time at a cooking class in Ubud, Indonesia. I love love love taking cooking classes when I travel and always seek out a cooking class or two. I mean in Thailand alone I took close to 10 cooking classes (which is where I learned my all time favorite Massaman curry recipe). So when I got to Indonesia and tried the delicious cuisine for the first time I knew I would be signing up for a cooking class. Indonesia is made up of thousands of islands and the cuisines differs significantly on each one. When we first landed in Jakarta on the island of Java and made our way to Yogyakarta the cuisine was completely different from the Balinese dishes we tried on the island of Bali. Surprisingly for me I have never seen an Indonesian restaurant in the US nor had I ever even tried Indonesian cuisine before our trip. This is seriously unfortunate because Indonesian cuisine and food is so rich, fragrant and flavorful – it almost reminds me of Thai food in it’s use of similar Asian style ingredients and pastes used to flavor dishes. I am sure you can imagine that this basic sauce has nothing basic about it and is actually a flavor explosion in your mouth! 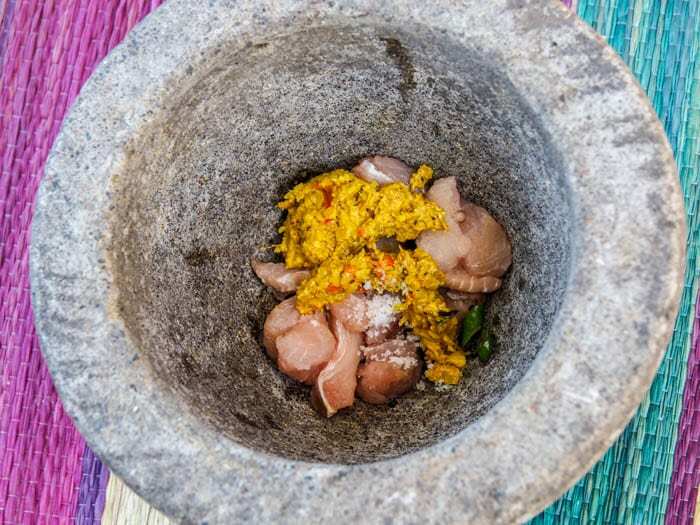 The way to make this paste which is then added for the grilled fish skewers is to mash everything together, mortar and pestle style, except here the mortar is more in the shape of a flattened plate, rather than the more common form. For simplicity, and the fact that certain ingredients are hard to find abroad this paste can be made with red hot chili peppers, ginger, turmeric, galangal, shallot, garlic, macadamia nut, coriander seeds, white pepper, black pepper and lemongrass. All of those ingredients should be easier to find, especially if you have access to an Asian super market for the galangal. Once we had the basic sauce paste ready we were going to use two other key ingredients – fresh cubed tuna fish and grated coconut. 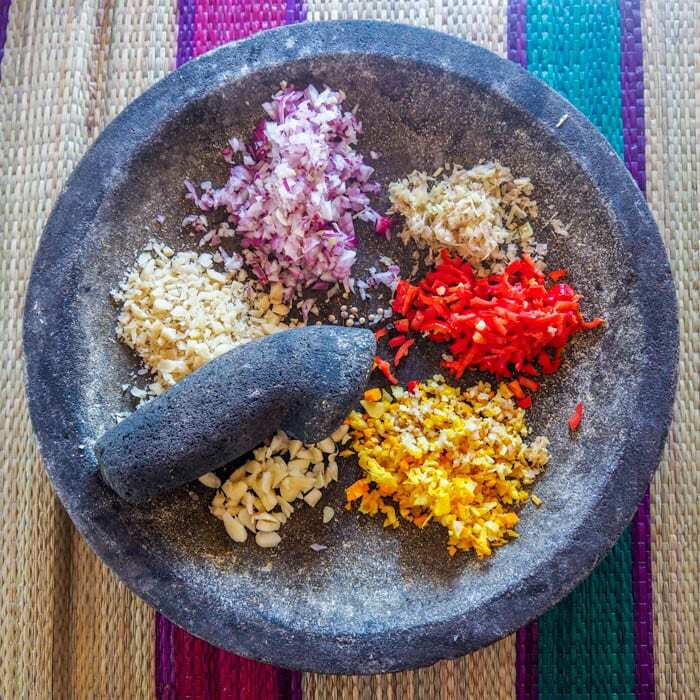 These ingredients are then mashed in a large mortar and pestle with the addition of fried shallots, minced celery, salt, palm sugar and fried garlic. Once those are formed into a ground fish mix, the grilled fish skewers are ready to be formed. As the cooking instructor explained the fish is better when pounded in a mortar and pestle so that the fibers stay intact and the fish stays together better on the skewers. You can imitate this same “mashing” with a food processor but the blades there can destroy the fibers, so if you have a mortar and pestle, and a bit of patience I highly recommend avoiding the food processor short cut! Once we formed the grilled fish skewers but grabbing small handfuls of the mix and forming around a bamboo wooden stick the fish was ready to be grilled. And then we got to enjoy these super fragrant tuna based grilled fish skewers with a peanut based sauce. This dish was absolutely delicious and that “basic sauce” when mashed in with the tuna and grated coconut really takes these grilled fish skewers to the next level. 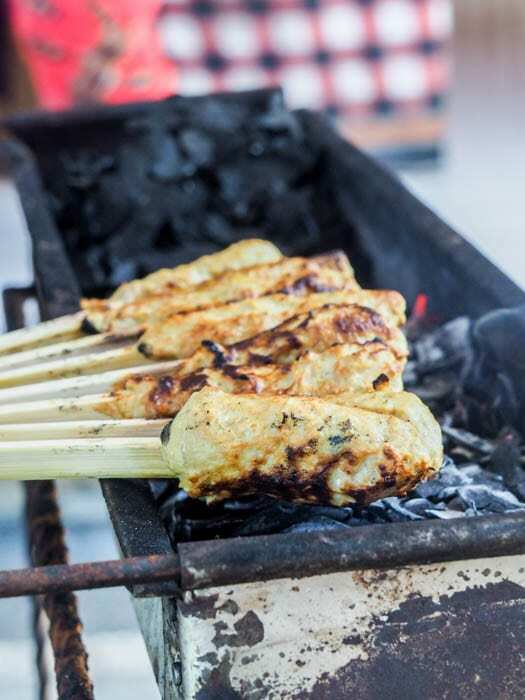 These grilled fish skewers are a classic Balinese recipe which I hope you will attempt to recreate in your own kitchen. 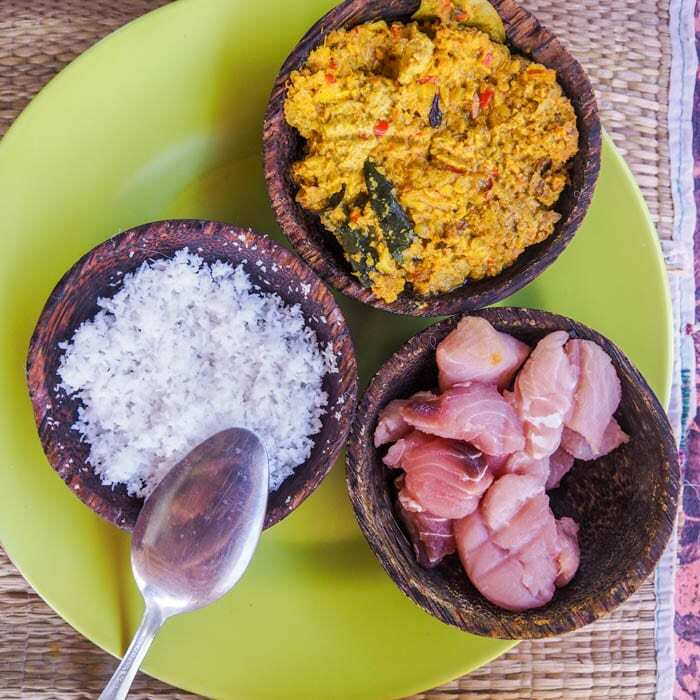 Even if you have to take the short cut using the food processor to grind the fish, and even if you’re missing some of the ingredients for the Balinese paste I still highly recommend you give this recipe a go. Surprise your Memorial Day weekend guests with this different Indonesian themed grilled fish recipe. 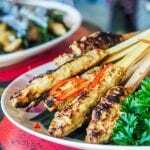 If you’re looking for other grilled recipe ideas be sure to check out my grilled chicken thighs and my grilled swordfish kabobs. To make the Balinese basic sauce combine all ingredients except the bay leaf in a food processor and blend, or use a classic mortar and pestle and pound until a smooth paste forms. In a pan cook the Balinese basic sauce for a few minutes with the bay leaf, adding in a few tablespoons of water or vegetable stock. Remove the bay leaf. 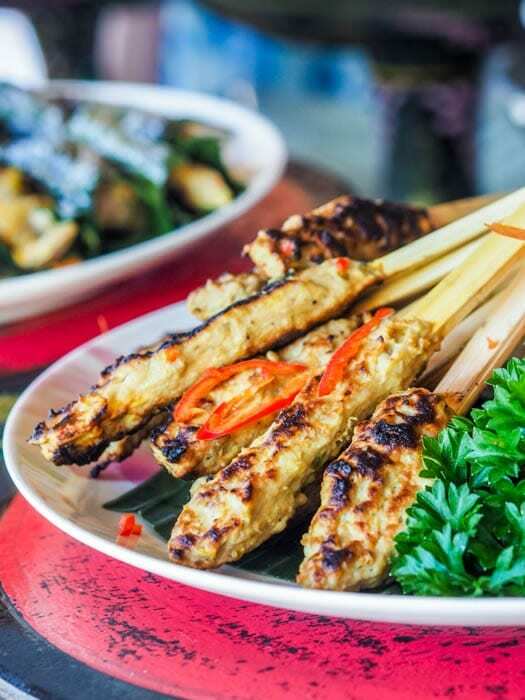 To make the grilled fish skewers in a food processor or mortar and pestle combine the fish with 5 tablespoons of the Balinese basic sauce, fried shallots (optional, can be omitted), celery, salt, shredded coconut, brown sugar and fried garlic (optional, can be omitted). Process or pound until a almost smooth ground fish paste forms. Adding a bit of water to your hands first, grab small balls of the ground fish paste and form into longer oval shaped forms molding it around the wooden or metallic skewers. Grilled for a few minutes on each side until cooked through. All the flavors here! I love all the different flavors in Asian cooking. It can be overwhelming when you look at ingredient lists, but once you have them all, magic happens! Yes, exactly – the ingredient list can be overwhelming but you just need to stock up once and then a whole world of Asian cooking opens up! I want to make this NOW! Those flavors sound absolutely divine– like a slap in the face with the best tastes on earth! Now I have to visit Indonesia! Bucket List! These look and sound so delicious. Amazing flavors! This sounds so flavorful. I love that you take cooking classes when you travel. What a fabulous idea! Yes cooking classes are the best! I LOVE them! A fabulous cuisine; in London there are many Indonesian restaurants, and we love the fragrant ingredients used. Makes me want to visit the country. Your fish skewers look very tasty indeed. Thanks! That’s great there are Indonesian restaurants in London, there don’t seem to be any in Boston or in the US! What a cool way to eat tuna! The flavors in this look phenomenal. And is it just me, or is food eaten on a stick so much better than food not eaten on a stick? I can’t wait to try this! Thanks! Yes food on a stick instantly becomes more interesting and exciting!